Seeing the name of this restaurant for the first time, I translated it as "Did you see the radish, Country Chicken?" "Well," I thought, "that's a pretty bizarre name, but Korean restaurants are always coming up with strange names." 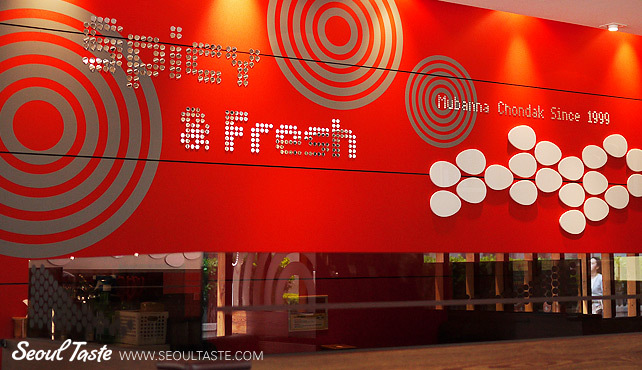 However, after some research, I realized that this chain actually originated in Busan, and in their dialect, "무봤나? 촌닭" actually means, "촌닭을 먹어봤니?" in standard Korean. Thus, their name really means, "Have you tried country chicken?" 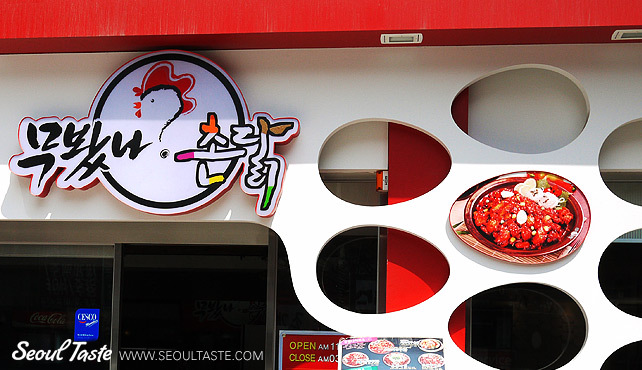 Korean chicken is, for many visitors, a must-try. As chicken restaurants also have free-flowing beer on tap, they are often frequented by locals as well, for dinner and post-dinner get-togethers. Often the chicken is deep fried and brushed with a special blend of sauces to enhance the flavor. On our first visit, after studying the menu for a long time, we decided to try the 순살 고추장 바베큐 (boneless chicken in chili pepper paste sauce) lunch set. This set is perfect for 2 people: it includes the dish plus two bowls of rice and a soda for 16000원 (less than the regular price of the dish itself). After ordering, you get a empty bowl. First-timers stare at it blankly for a while, but the idea is you go to the self-serve, all-you-can-eat "salad bar" and grab whatever you want. 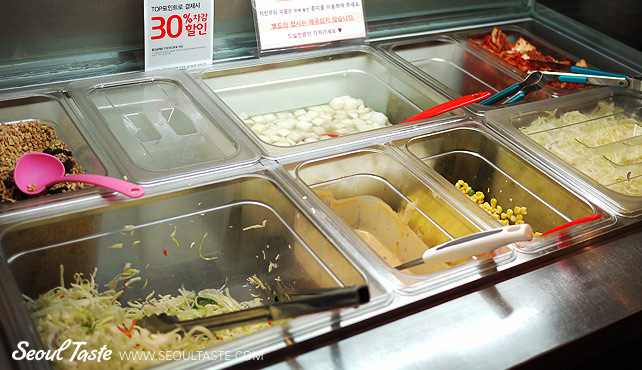 The selections include side dishes like pickled radish, pickled cucumbers, kimchi, shredded cabbage, corn, and... cereal? That's right, they've got corn flakes! My favorite happens to be kimchi, so I just grab some of that to eat while we wait. Soon, the chicken is served. On our first visit, it was love at first bite. Sure, this chicken is different from the rest, not being deep fried (or any kind of fried, for that matter), but the taste is quite addictive. Aside from the spiciness, this 고추장 (chili pepper paste) sauce also has a smokey barbecue taste to it, as if it were grilled. 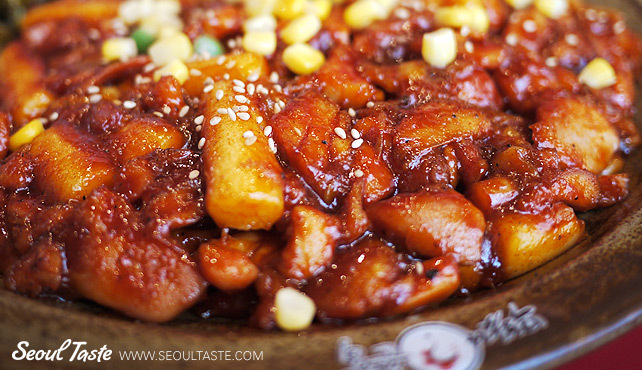 The 떡 (Korean rice cake) in the dish is tender and goes well with the sauce. Food: 5/5 - Based on at least 5 visits to this place and ordering the same food (we'll try something new next time, we promise! ), the freshness, flavor and preparation have been consistently excellent.